Let's Just Build a House! 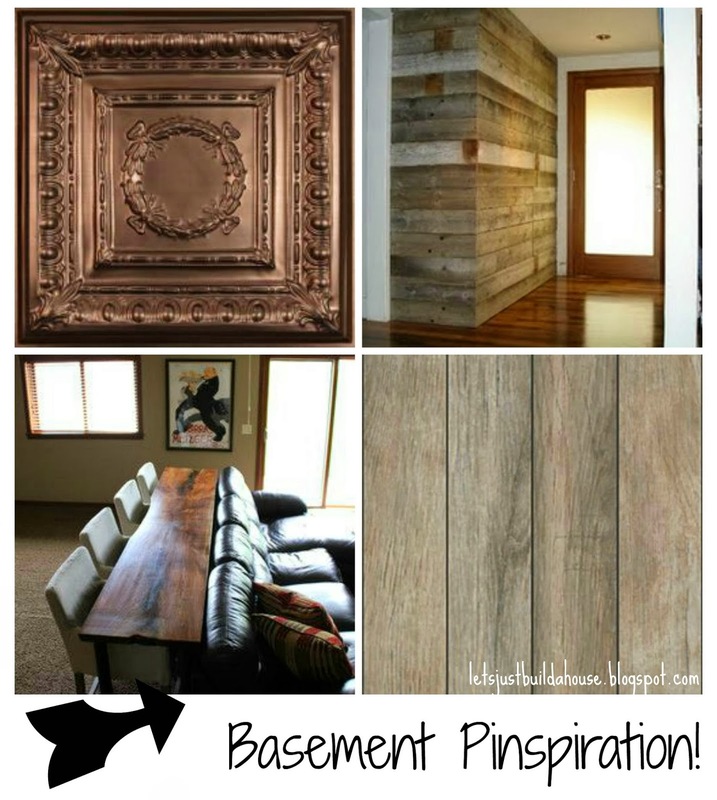 : Basement Finish and why it's not called a "Man Cave"
Basement Finish and why it's not called a "Man Cave"
So, today we are doing to daydream together. Are you ready? We are daydreaming about my basement. No, not a creepy cold dungeon basement (which is what it kind of is right now) but a rustic, chic-yet still manly retreat. A place where the beer flows on Saturday nights. There’s a big fluffy overstuffed sectional for napping and watching Roseanne Marathons on Sundays. This basement boasts an in-law suite, with a full guest bathroom, and a library/office. This is our basement dream. We currently have a totally unfinished walk-out basement. It’s plumbed, it’s wired up, and we have a few walls dry-walled. But basically, I say it's unfinished because it has nothing else. Concrete floors and a bunch of boxes. We have 1,000’s of ideas for the space. Thanks to Pinterest we change our minds weekly. This is going to be a totally DIY task as we want to spend as little $$$ as possible. We have a wagon load of free salvaged barn wood we’d like to use. We received kitchen cabinets and granite counter tops from my parents’ old kitchen. We are planning an eclectic/rustic look to pull it all together. Floors: We are going with a tile for the flooring. It’s easier to keep clean than hardwood, and can handle spills. With a wet bar, and our friends….there will be spills. I want a tile that gives the illusion of warm hardwood. I poked around on Mohawk’s site and came up with the State Point in Stormy Gray. Perfect. I think something like this would look great with the Barn wood accents we want to incorporate like in the top right corner. 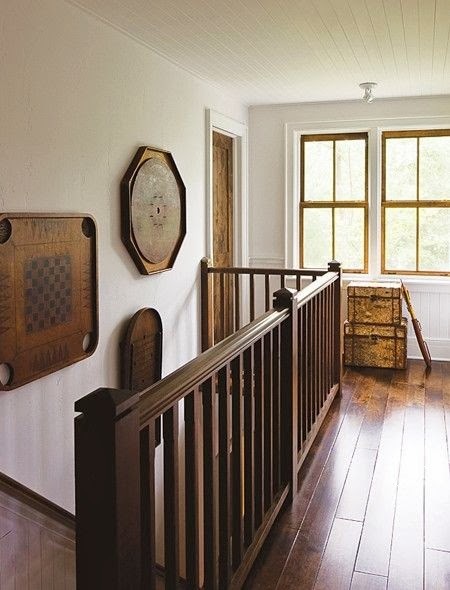 Walls: A perfect place for a partial barn wood wall? I think so! I'm sure we will add other rustic touches. Like maybe hang my vintage game board on the wall I scored at an auction! Furniture: As for the seating. We want to have a big comfy couch to watch movies. I think seating with a counter behind the couch would be a ideal layout. This way kids can still sit downstairs and eat their snacks and watch tv…without as many crumbs on the couch. I think it would be also a great set up for buffet style get-togethers! Ceiling: The ceiling is one of the biggest part of the project we are talking about. We discussed dry-walling the entire ceiling. We do not like the look of the drop ceiling tiles at all. They are spongy and remind us of office buildings. It just not the style we are going for. Putting drywall on the ceiling not only takes material, lots of labor, and time, but it also can be a problem if we ever have plumbing issues or electrical problems. All of our pipes and lines need to be accessible. So the answer could be: Decorative drop ceiling tiles! Ceilume offers gorgeous drop ceiling tiles, and from what we've seen, at decent prices. We are still calculating the cost difference versus drywall. But if we used something like the Empire Faux Bronze Ceiling tile pictured above, it would add the warmth we want, the rustic, the chic, and the easy access if we need it! How fab would that be? And now for the most important part of the basement finish: The bar. 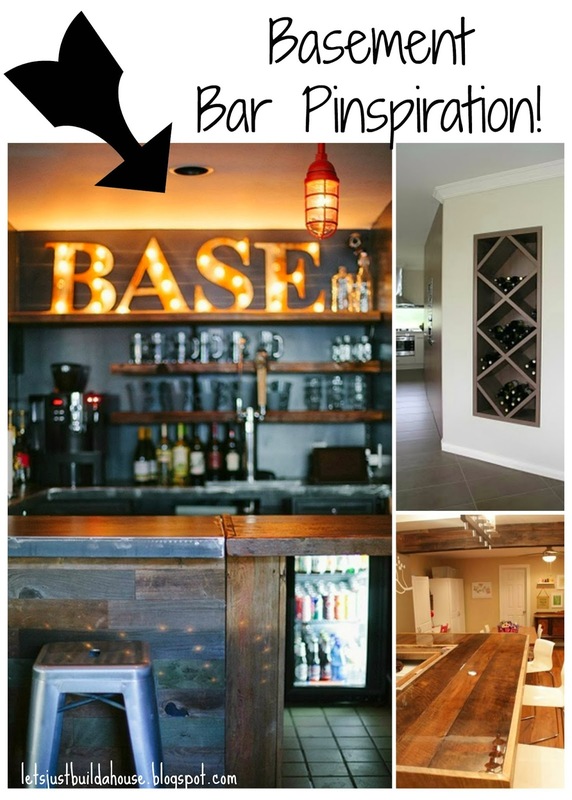 The Bar: We are using barn wood and barn beams as much as possible. Adam has a plan. I have a request for a huge wine rack. Filled with lots of wine. We've been collecting vintage tavern treasures to use in the bar before we even broke ground on the house! We are using the hand-me-down cabinets and granite counter tops from my parents' old kitchen. They will be our base and exterior of the bar area. Adam plans to build the actual 'bar' from scratch. We're also considering DIY concrete for front bar. But Adam is worried they will be too cold when people rest their arms on the bar. What do you think? This is more Adam’s space than mine. Not that the entire upstairs is my space, but I usually have the final say on what goes on the walls and what we sit on. What can I say? I am a hip home blogger, he has to trust my style choices. (Please note the sarcasm.) But although I will be spending time downstairs in this space, and so will our future chillens, this is going to be Adam’s Space. I am neglecting to use the term ‘Man Cave’ because I feel like things could get a tad out of control…no one wants a Big Lebowski Poster in their hip and cool basement right? 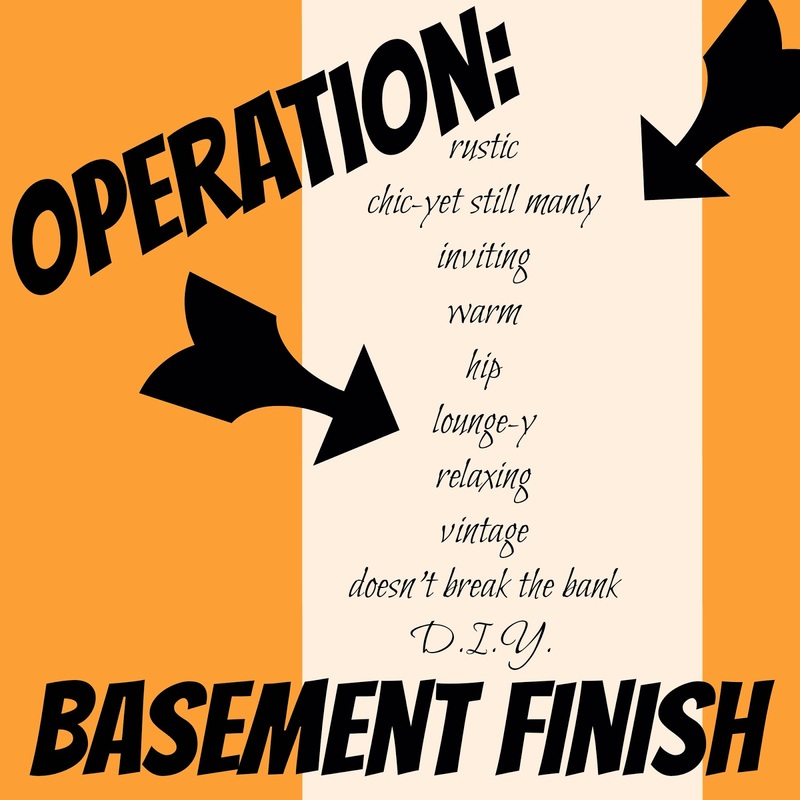 Do you have big plans for your basement? Does your husband have a 'man cave', do you get to help decorate it? P.S. I've pinned all of these on my basement pinboard. 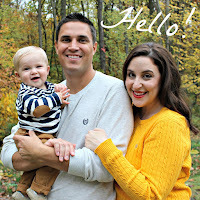 You should probably follow me on Pinterest if you don't already! love this idea... I've been on Andy to build us a sofa table/counter for our living room area so we can watch tv and eat dinner. Yeah I think it's a perfect setup! I want it! sounds like a great space....I love the look of those ceiling tiles! Thanks Gretchen, I hope we can pull it off! This looks *awesome*! Also, the term "man cave" is so... ugh. Don't get me started! Love that inset wine/beer thing. Here, here! When and how in the world did that become a thing! Agreed. I don't love it that's for darn sure. Love all the inspiration! Those ceiling tiles are pretty cool. We were thinking about using something like that in our basement, if we ever get around to refinishing it. I think the ceiling tiles is going to be the real game changer! We don't have basements in this part of the country. I love your inspiration---it looks like it's going to be a cool spot to hangout! That's so strange that there are no basements in some areas! Thanks Jennifer we hope so! i have HUGE hopes for my basement - right now it's a BASEMENT - so it's a blank slate - i really hope to make it a gathering place!!! I can't wait to start dreaming of our basement...it will be a while! You have great ideas that I may steal one day. ;) We've gone back and forth on the ceiling issue too. We also hate regular drop ceiling tiles, so I'll have to check out the place you mentioned above. I love your plans! This is going to be good! Wow, your inspiration pics are beautiful! Love where you're headed! I hate the whole "man cave" thing too.